Dusty blue is all the rage this year so we offer it in several shades. 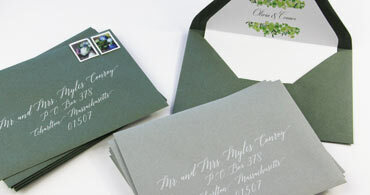 Envelopes feature a stylish Euro flap and a smooth, matte, uniform finish. 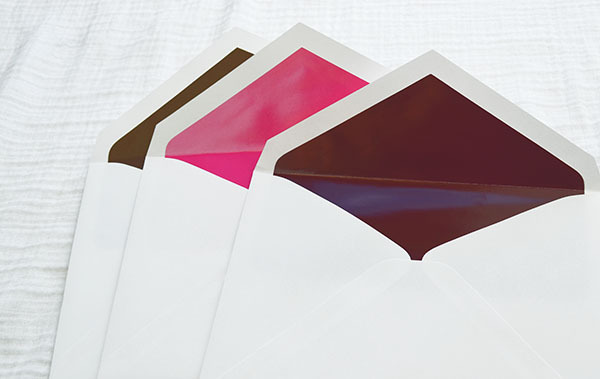 Order envelopes blank or let us print your addresses for you! 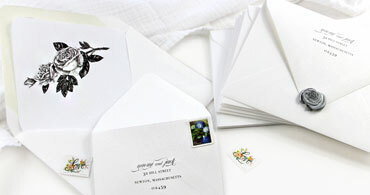 Wedding white envelopes are some of our most elegant, versatile and popular wedding envelopes. Choose from cotton and matte finishes, traditional and deckled, frayed flaps and oh so many sizes. Shimmering, shining metallic envelopes are always a popular choice for weddings and are especially stylish with a modern Euro flap. Shop our colorful, eye-catching collection here (blank or addressed, of course)! 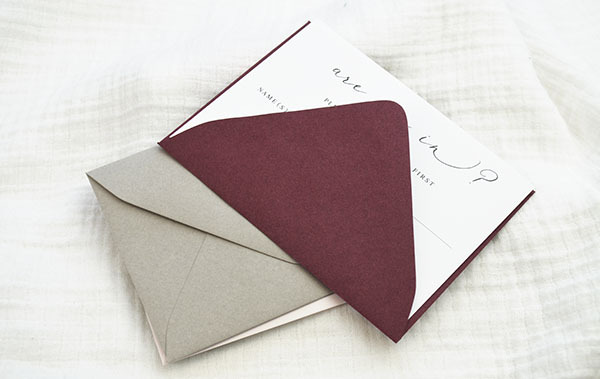 For traditional taste, our collection of classic double wedding envelope sets. Double envelope sets consist of an inner envelope and a slightly larger, protective outer mailing envelope. Choose from several sizes and lining colors. 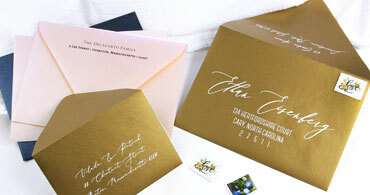 For the eco-conscious, recycled invitation envelopes in all sorts of colors, finishes and sizes. For traditional taste, we offer 100% recycled white envelopes. 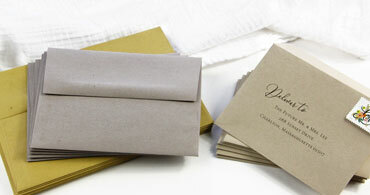 For rustic style, kraft envelopes in so many shades. 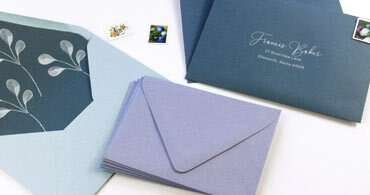 Matching recycled paper is available so you can complete your earth-friendly invite ensemble. 48 cool, contemporary colors and a variety of popular sizes to mix and match! Our colorful matte envelopes are made with heavyweight paper and feature a stylish Euro flap. Pair with matching papers and order blank or addressed and printed. Create your own custom lined Euro flap envelopes with our Euro flap liner paper. Available in matte and metallic finishes, blank or printed with your custom design. 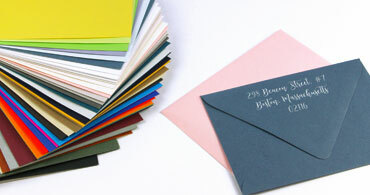 Mix and match with dozens of colorful envelopes for endless possibility. 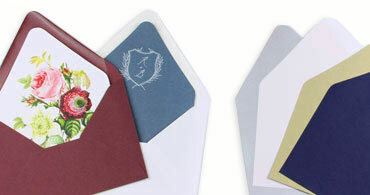 There are two popular size options for wedding response envelopes. 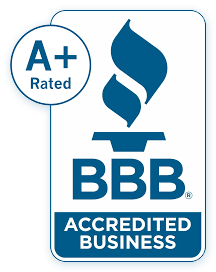 Learn about them and shop them here. Envelopes are available blank or printed (because let's be honest, printing little reply envelopes at home isn't always easy)! 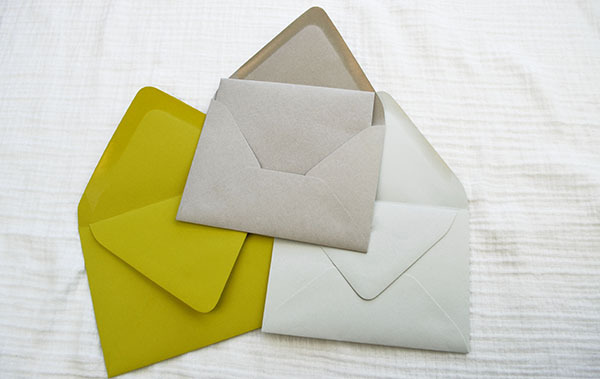 Just the inner envelopes from our double wedding envelope sets, inner wedding envelopes are ungummed and offered in a wide variety of sizes and liner colors. Use them on their on with an alternative sealing method, or pair with an outer envelope.